Dishoom is throwing its annual Bombay Vintage Glam party this New Year’s Eve. Eat and drink to your heart’s content at one of Dishoom’s six sites - the night kicks off with a glass of cold fizz and is followed by a hearty 10-dish feast of Dishoom classics including the chicken berry biryani and house black daal. Dinner will be followed by dancing until late, and this year at the new Dishoom Kensington, a live jazz band will provide the soundtrack to the festivities. 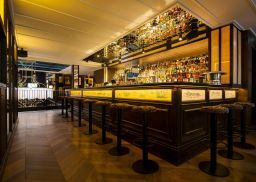 Hovarda, the new Aegean bar and restaurant in Soho will be open until 3am on New Year’s Eve with a DJ and live music. The team has put together a delicious menu including tuna tartare, yellowtail with cucumber, chilli, coriander and lime and mains such as wild catch of the day and kleftiko, with a glass of champagne on arrival. Istanbul-inspired meyhane and mangal, Yosma, is bringing a sense of Turkish spirit to Marylebone for their late-night New Year celebrations. From 9pm - 3am, the restaurant will be running a buffet-style menu featuring some of executive chef Hus Vedat’s favourite dishes, as well as plying guests with Raki sours until midnight. There will be DJs playing live music through the night, and advance tickets are £50. For a lesson in indulgence, treat yourself this New Year’s Eve at Angela Hartnett’s Michelin-starred Murano in Mayfair. The team are putting on a decadent seven-course tasting menu, including Confit Pink Fir Potatoes, Tunworth & black truffle; Turbot, oyster, cucumber, caviar, broccoli, tartare sauce and Rib of beef, preserved tomato, hispi cabbage, smoked bone marrow. Round off the meal with desserts of Caramelised Amalfi lemon Tart and petit fours. The Curtain hotel and members club in Shoreditch is celebrating their first ever New Year’s Eve with not one, but three almighty parties. A Harlem Nights themed soiree at Red Rooster, a nod to its sister restaurant in NYC, and a Mediterranean Feast on the rooftop LIDO, tickets to which also include access to the Members’ Club New Year’s Eve Party in the basement, a night inspired by David Mancuso’s legendary Manhattan loft parties with six DJs on rotation.